Penn A-1 has a very dark green coloration, fine leaf texture, tremendous heat and cold tolerance, very high density, and superior disease resistance. It has very good winter color and spring green-up. It provides a superb putting surface and will provide an excellent playing surface on tees and fairways too. Recommended seeding rate 1.25 to 1.50 lbs/1,000 sq ft for new plantings and 0.1 to 0.25 Ibs/l ,000 sq ft for interseeding. 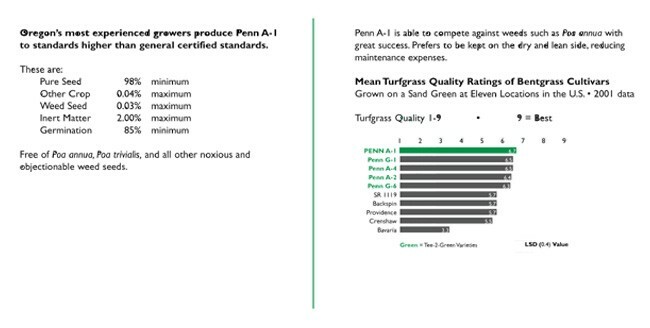 It has proven adaptable to various growing conditions and management practices.There is University data showing that Penn A-1 is able to compete against weeds such as Poa annua with great success. Prefers to be kept on the dry and lean side, reducing maintenance expenses. It has been stated that these grasses are different and not to be managed as other bents. Summarizing this, it means less fertilizer, less water, less babying than the old bents that superintendents are accustomed to. 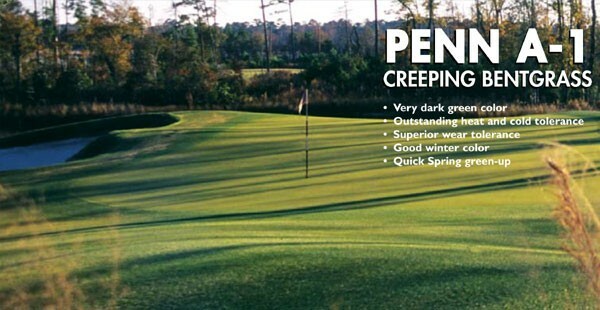 In other words, it adds up to less worry.These bents are tough, useful grasses that require different management, but overall the management is actually easier than the superintendent is accustomed to.The end result is a very high-quality playing surface that thrives on low mowing and culminates in near-perfect conditions, with no extraordinary practices. The formulations and rates may need to be adjusted according to soil test results and turfgrass performance of the listed grow-in. After the turfgrass has grown in, fertilizer applications should be kept light and infrequent.This can be accomplished by the use of a fertigation system or a soluble product. 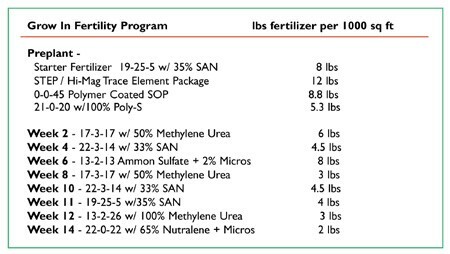 The amount of the fertilizer should be .1 Ibs of nitrogen every 14 days +/-, depending on approximate growth, clippings, and performance. The yearly amount of nitrogen will be from 2 to 4 Ibs, phosphorous 2 to 3 Ibs, and potassium 6 to 10 Ibs. As far as micronutrient amounts, this should be checked with tissue tests during the year and again with a soil test in the early spring. The first mowing should be done when there is uniform turf coverage with a height from 1/4 to 3/8 inches and definitely not more than a 1/2 inch. The mower should have a smooth front roller. It has been reported that some people have used grooved rollers too early. Clippings should not be caught early on, as this will help build a biomass or padding that will protect the plant from damage. During the early stage it is important to do a weekly light topdressing.This will cover the clippings and smooth any roughness in the surface as well as accelerate the filling-in of the turf grass canopy. It is possible to get to the desired mowing height within six to seven weeks after the first mowing, if not sooner.The Penn series grasses are maintained by most facilities at I /8 inch or lower for greens. It is important to irrigate only when necessary, such as when required fill the soil profile to field capacity or when trying to flush salts from the soil profile.This could be a 30 to 40 minute cycle, depending on the type of irrigation used or time of year. Do not irrigate the next few nights with a 5- or 10-minute cycle. Stretch the time between irrigation cycles as long as possible. Again, this will vary according to the time of year, but it is possible to go at least 4 to 10 days longer, only needing to hit hot spots if required. With regard to aeration, this has varied from course to course. Most golf courses aerate two to three times a year: in the spring, early summer, and fall, similar to what is currently being done with other bentgrasses. Some courses are going less, others more, but it all depends on the size of the greens, soil type, and traffic. Topdressing varies depending on management style, from light weekly applications to once a month when verticutting.As with all bentgrasses it is important to get as much topdressing into the canopy as possible.This can only be accomplished if the canopy is opened up by the use of groomers, verticutting, grooving, or spiking.